One of the great joys of traveling around this region of the planet is the vast range of landscapes that can be seen. This work is a recapping of these journeys. The monoliths of the southwest to the majestic mountains of Colorado to the seashore in Mexico, all are present within this work. The grander of a night under the stars far from the lights of the city can also be seen here. And of course, the tree of life. Standing back from the paper, working the whole body, I created this character on the page. This massive character feels to me like the four corners of the earth with a large pregnant belly. She is full of life, this earth. There is nowhere that life on her surface cannot be found. The depths of the ocean, near the hottest vents to the heights of the tallest mountains. The polar caps and the stark desert, all have life if we look close enough. The dot at the top of the character symbolizes the highest good that the earth brings to us. She hosts our awareness in form. The tree emerged next though was completed last. The symbol of the tree of life is an ancient one. Surrounding this tree are circles representative of the geometrics of life. 0, 1, 2, 3, 4, 5, 6…. all represented here in form are but initial seeds that the planet uses to create life. The ancient mountain behind, like the tree, represents the center of the world. Some called it Mount Meru… but its purpose it to center ourselves in creation. Though unintended, a figure emerged next to the tree, like he is sneaking out. He is a wisp of a form not yet fully formed. Thus this side of the painting represents potentials. 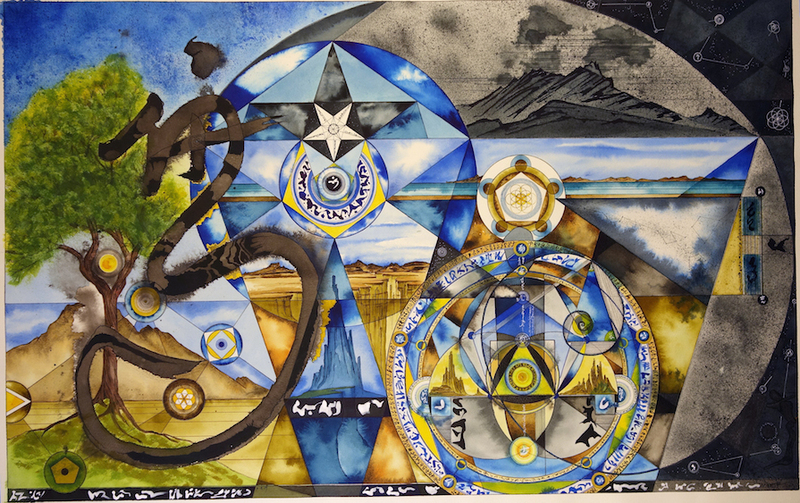 The opposite side of the painting is filled with sacred geometry and spiral forms. This section emerged next in the evolution of the work. This mandala represents the fullness of life in its completeness. 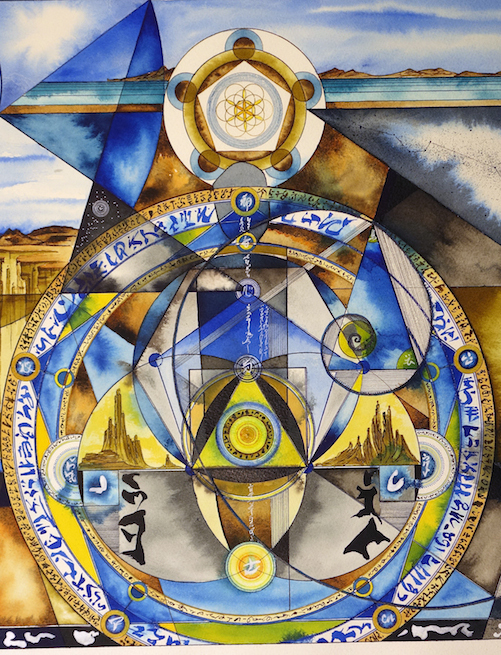 Geometric forms are illuminated in this circle, the center of which is the circle/triangle of creation. If one looks close enough the forms all share the same base line, as do the mountains towards the left of the piece. The vesica pescis is here as well in its triune form. Thus the feminine aspects of the work is manifesting form. 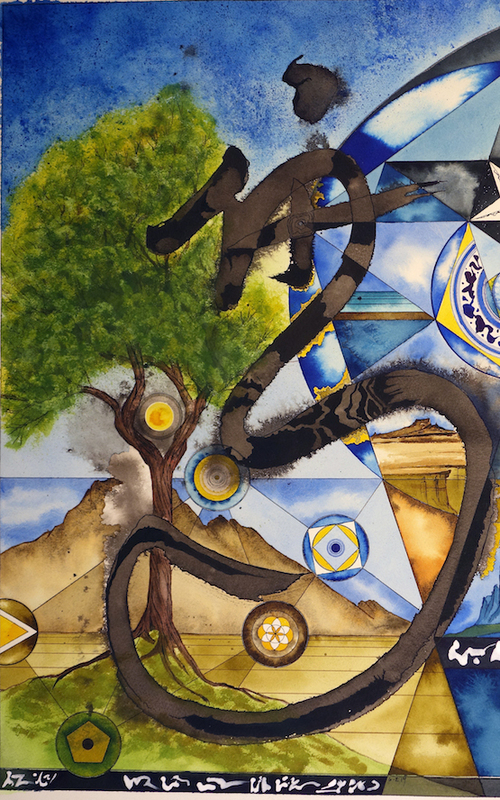 The glyphs throughout the work are calling us to deeper mystery and understanding of these geometric intricacies. A Fibonacci spiral starts in the right hand side of the mandala and spirals out to encompass the full work. All the way to the right are the stars, heavens and constellations where we see patterns built up over time and history. The center of the mandala also shows a figure, now fully formed and with chakras running through its center. This is life aware of life. Between the potential and the fully formed womb mandala is a second mandalic form. This form is the abstract form of life. This came into being last as the work was created. This is where the geometry and the numbers are hidden in the relationships of the angles manifested in the pentagram. I purposefully chose to use the pentagram for the majority of the lines, linear relationships and ideas throughout the work. When one studies these relationships one finds numerous natural progressions within this geometric form. The pentagram is also female as full mother. The Fibonacci spiral and its root relationship, phi, are found in the angles of the five pointed star. The angles which are 72, 18, and 36 make up the windows that one sees into through this work. These relationships are found in the way trees grow, animals reproduce, bacteria replicate, coral builds, and a host of other natural phenomenon. The sacred flower of life, the relationship of 6 circles, is held within the matrix of the relationships of 5. In this way, between the two we have most of the representative constructions of DNA life on earth. Take into account the four fold chemistry of DNA, the way in which it spirals – a progression of threes – and the work vibrates with life to me spiritually. I am playing with they eyes. As my wife says of this piece, “I don’t know where to look next.” And this was also intentional through the work. 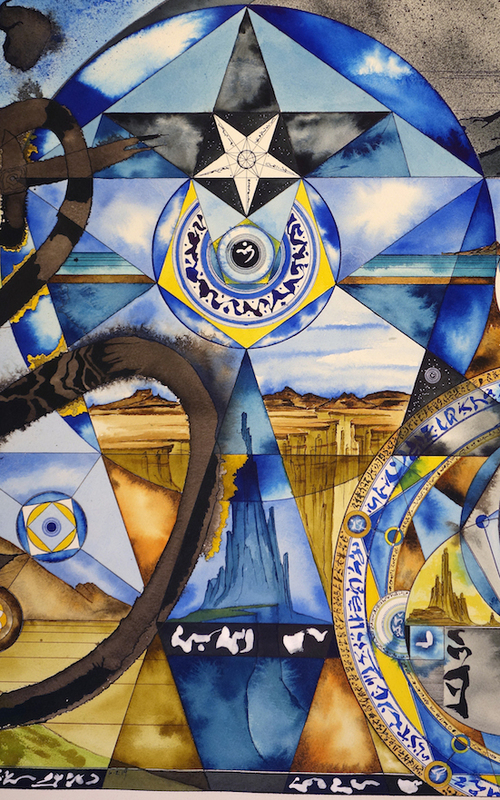 I want the eye to move around, dart, and assemble different forms, pictures and relationships within the whole. This is what it is like to travel the earth. She is an amazing beauty and there are constantly unfolding things to see and understand within her creation. Thus the eye darts here and there. The work is also one of my largest, that being 25×39. It is intended to be seen from far away and close up. An experience that is often lost on the computer screen. We have so much to explore, the work is a testament to that constant exploration. This is so beautiful and nice to see it in small sections with commentary!